The great hornbill or Buceros bicornis also known as the great Indian hornbill or great pied hornbill, is one of the larger members of the hornbill family. It is found in South and Southeast Asia. Its impressive size and colour have made it important in many tribal cultures and rituals. The great hornbill is long-lived, living for nearly 50 years in captivity. It is predominantly frugivorous, but is an opportunist and will prey on small mammals, reptiles and birds. The great hornbill is a large bird, 95–130 cm (37–51 in) long, with a 152 cm (60 in) wingspan and a weight of 2.15–4 kg (4.7–8.8 lb). It is the heaviest, but not the longest, Asian hornbill. Females are smaller than males and have bluish-white instead of red eyes, although the orbital skin is pinkish. Like other hornbills, they have prominent "eyelashes". 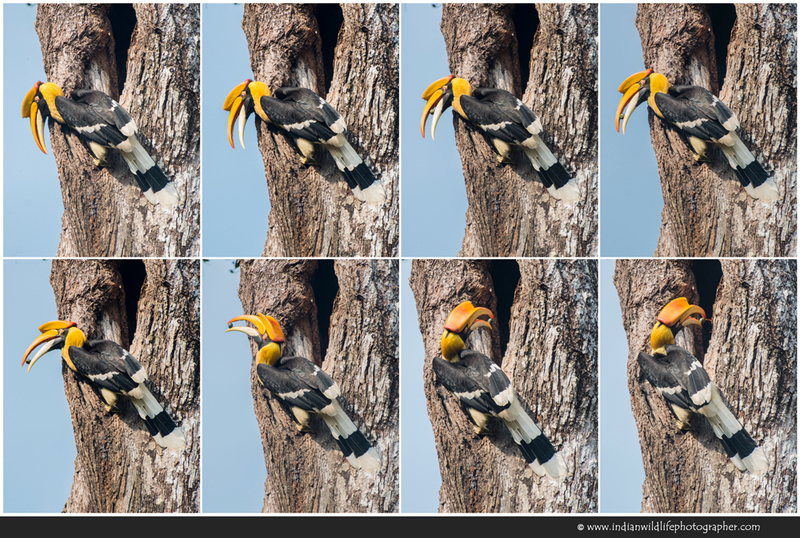 The most prominent feature of the hornbill is the bright yellow and black casque on top of its massive bill. The casque appears U-shaped when viewed from the front, and the top is concave, with two ridges along the sides that form points in the front, whence the Latin species epithet bicornis (two-horned). The back of the casque is reddish in females, while the underside of the front and back of the casque is black in males. The casque is hollow and serves no known purpose, although it is believed to be the result of sexual selection. 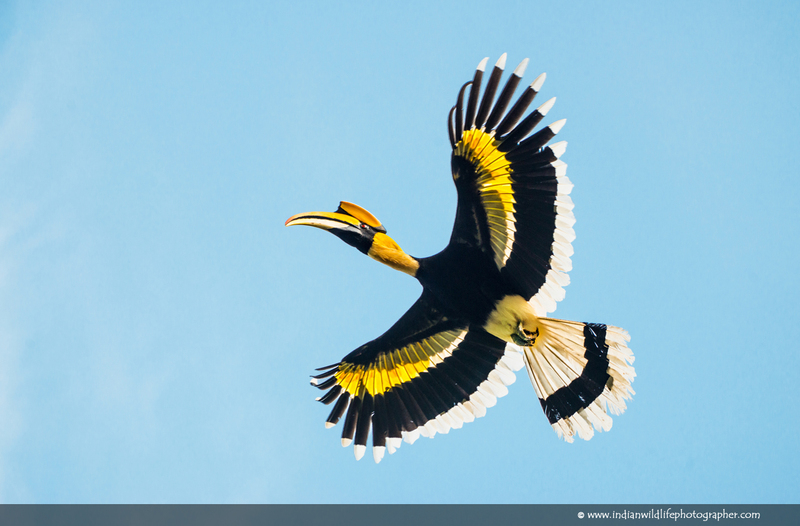 Male hornbills have been known to indulge in aerial casque butting, with birds striking each other in flight. The male spreads the preen gland secretion, which is yellow, onto the primary feathers and bill to give them the bright yellow colour. The commissure of the beak is black and has a serrated edge which becomes worn with age. The wing beats are heavy and the sound produced by birds in flight can be heard from a distance. This sound has been likened to the puffing of a steam locomotive starting up. The flight involves stiff flaps followed by glides with the fingers splayed and upcurled. They sometimes fly at great height over forests. copyright @ www.indianwildlifephotographer.com. Simple theme. Powered by Blogger.